Most people take eating and drinking entirely for granted. However, for Tasmanian woman Jacinda Turner as much as a mouthful of food will leave her sick and in constant pain. The 34-year-old registered nurse from Launceston, first started being sick four years ago, but was told by doctors she had a bug, or possibly a viral infection. She also developed pain she compares to having “shards of broken glass” in her stomach. But when her illness failed to clear up, medics started to explore further. Months later, after losing 9kg, she was diagnosed with a condition which leaves her stomach muscles paralysed. She is one of an estimated 125,000 people in Australia with a condition called gastroparesis. Normally when food or drink goes into the stomach the muscles grind it up so it can pass into the small intestine. But this condition means the muscles don’t work because of a damaged nerve. Now, Ms Turner is kept alive by liquid food, as well as drugs, which she must put into her body via three different tubes. She has been forced to give up her hospital job - she must rely on partner Brad as she’s not eligible for Centrelink payments - and said life can be tough. “I can’t eat and I can’t drink,” she told nine.com.au. “If I have, then I’m violently ill and my stomach blows up. The pain and the nausea can be tremendous. “I have days when I get emotional. I look at it, as there’s people worse off than me. While she said she is happy to go out and socialise, Ms Turner said it’s hard for people to understand she can’t order food or even a drink. She’s even had people believe she’s suffering from an eating disorder. And of course she misses her favourite foods. “I went to a wedding a couple of weeks ago and the poor people kept coming and asking me are you sure you’re okay - I say ‘no sorry I can’t eat’. And while the condition itself doesn’t kill, complications can. One of Ms Turner’s three tubes - she has one into her heart, one into her intestine and another into her stomach - caused sepsis, which almost ended her life a few years ago. And while it can be linked to diabetes, in most cases the cause is unknown. The condition mainly affects women aged 16 to 30, and because it is not well known, it can take years to get a diagnosis, experts have said. Jacinda’s father Dennis, 65, a retired builder, has dedicated himself to raising money for research into the condition, so far gathering $80,000 with the help of Devonport Rotary Club. “I’d like it so she could live a decent life,” he told nine.com.au. 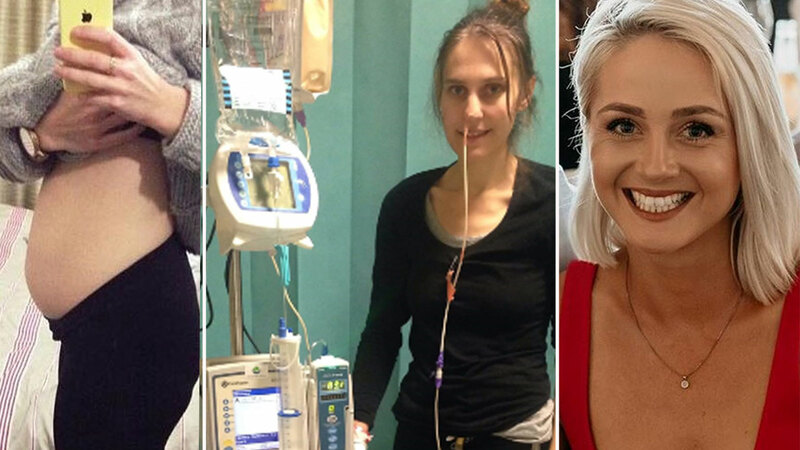 Another gastroparesis sufferer, primary school teacher Emily Pickett, 23, from the Gold Coast, admits she fears she will one day have to be tube fed like Ms Turner. For now she is able to eat small amounts of food, but is in constant pain. She started feeling sick aged 13, and became so bloated after eating, as the food would just stay in her stomach, she said she appeared pregnant. Some days she was so sick she simply curled up on the floor, and she missed a lot of school. She also had to give up on her promising swimming career. Doctors initially dismissed her complaints. “They thought a lot of it was all in my head- that I was making a lot of it up and I needed to see a psychologist,” she said. After trying everything including various diets, she saw a gastroenterologist. Tests revealed her stomach was blowing up to as much as four times its normal size, because it wasn’t emptying. She was finally diagnosed five years after she first started suffering symptoms. Now, she must eat very carefully to try and avoid having to stop eating all together. “I think that always is in the back of my mind - when is that going to be?” she told nine.com.au. “At the moment that’s my motivation to try and keep myself eating as much as I can. Gut expert Dr Jerry Zhou, from the GI Motility Disorders Unit at Western Sydney University, is working on research which might one day result in a cure. Dr Zhou, who also works on online support group, Gastroparesis Australia, admitted even he hadn’t heard of the condition before he got involved. But he said it’s a distressing disease. “Eating and drinking is such a social component of life, and not being able to do that and missing out - it’s more than just not being able to eat - it’s losing that aspect of your life,” he told nine.com.au. Tniy Cars Playing Tennis ! Learn How To Tennis For Kids with Trucks Cartoon !